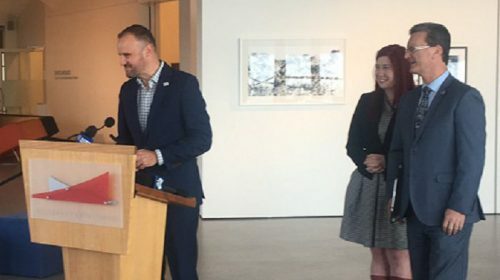 A TRIUMPHAL Andrew Barr, today (May 15) unveiled what he said was, since self-government, an “unprecedented” funding boost of $21 million to the ACT arts sector – but it wasn’t all it was cracked up to be. Flanked by Arts Minister Gordon Ramsay and Member for Ginninderra, Tara Cheyne, the Chief Minister was visibly flattered by the enthusiastic turnout, and indeed it was quite a line-up of movers and shakers from key arts organisations and members of the Belconnen arts community who turned out at Belconnen Arts Centre to hear a pre-budget announcement of funding, which Mr Barr told us is designed to help make Canberra “are more inclusive place” by 2020. The biggest ticket item, later outlined by Mr Ramsay, would be the $15 million over three years for Stage II extensions to the Belconnen Arts Centre in the form of a 400-seat multi-use town hall/performance space, improvements to workshop spaces, new dance studios and an expanded exhibition space, approved, he said, by both Labor and the Greens. But when it came to the announcement most of those present had come to hear, a “new” baseline of $750,000 per annum for arts project funding, the response from individual artists was one of disappointment. It might sound a lot but in fact this allocation, if compared to $725,000 for the year 2016, represented only a $25,000 increase, whereas the Labor Party had committed to increase this pool by $500,000. And, in December 2016 it was announced that project funding was dramatically reduced by the arts bureaucracy, after which consultations between Minister Ramsay and representatives from the arts sector led to an undertaking that would not happen again. The Minister was quick to point out, however that the baseline $750,000 did not include $100,000 to Aboriginal artists, $130,000 to the festival Art Not Apart, $120,000 to the Canberra Writers’ Festival and $120,000 to DESIGN Canberra, funding for Kulture Break and the ANU’s new advanced music performance, the Cultural Facilities Corporation. The baseline also didn’t include pop-up events events in Woden and Gungahlin. The devil was in the detail, however, with some of those allocations to run over three years and some over four years. But a calculation by the Childers Group estimates that even if you counted the $100,000 set aside for Indigenous artists, the figure fell $375,000 short of fulfilling the spirit and letter of the government’s former commitment. Mr Barr said the funding would give “certainty” to artists for four years, but a representative of the Canberra Arts Action Group described the funding announcement as “a betrayal”. On the positive side, representatives of Ainslie Arts Centre, Gorman House Arts Centre, Strathnairn, Tuggeranong Arts Centre and Watson Arts Centre were pleased to learn of a substantial allocation to make improvements in these urban arts centres. 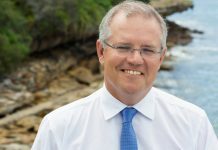 Overall, the announcements seemed like a considerable boost to residents of Belconnen, a fast-growing area in area in which, the Chief Minister agreed, major developments required an extended cultural infrastructure. But, he assured those present, his government wasn’t about to divide Canberra up into regions, so that it would place equal focus on renewing the Canberra city area, particularly around the Canberra Theatre, considered state-of-the-art in the 1960s, but now inadequate to the population. There would be community consultation on the current performing arts capacity in the territory, including the Canberra Theatre. The old joke that Canberra was “100 suburbs in search of a city”, Mr Barr predicted, would no longer apply.